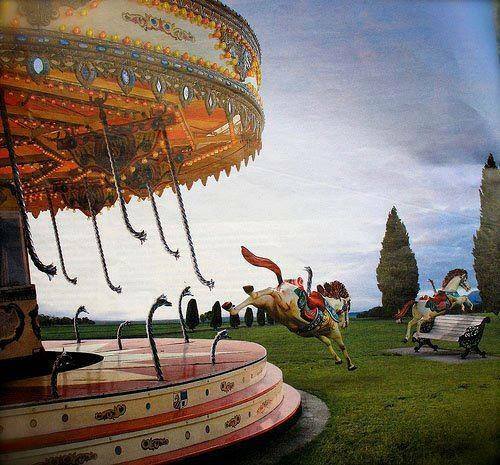 With a wrenching metallic noise, the carousel horse broke free. Someone screamed and I reached out blindly, groping for Sammy’s hand. It was clammy like mine and I felt an absurd sense of relief that I likely wasn’t the only one whose heart beat too fast, fear choking my throat and making my tongue dry. “What’s happening?” I whispered to her as the horse, carved wooden muscles bunching obscenely, leaped over the nearby park bench. It ran jerkily, stiffly, like it still didn’t have control of itself. My brain couldn’t seem to grasp what was happening, the sheer wrongness of the scene in front of me overwhelming me. Still frozen in stiff, carved poses, the remainder of the horses continued on in endless circles, the tinny music filling the air around us, perfectly normal except for the gaping hole where the horse had ripped free. “I don’t know.” Her voice shook. A second metallic squeal ripped through the air and Sammy and I both shuddered as a second horse came alive. I whimpered and pulled Sammy to me, needing her closer. Around us, the crowd jostled and surged, some people pushing closer to see, others trying to flee. Mass chaos was about to break out soon and I glanced around, trying to get my bearings. Instead, I saw brightly colored cheap stuffed animals jumping down from the midway games, lurching toward us with an awkward, lumbering gait. “I’m scared, Angel,” Sammy whispered as a third horse broke free with a wrenching noise and strangled whinny. “Me too,” I grudgingly admitted. I didn’t want Sammy to feel alone though. And who in their right mind wouldn’t be afraid of whatever the hell was going on right now? We’d gone to the park, expecting carnival rides and sugary elephant ears and gotten a nightmare of Stephen King proportions. A cartoonish laugh echoed through the air and I shuddered. “Oh God, not a clown. Please, don’t let it be a clown,” I begged under my breath. I glanced to my right as a fourth horse leaped down, the jerky movements becoming more fluid and lifelike. I finally spotted a break in the crowd and a small wooded area that would hide us from view as we worked our way toward the parking lot and, hopefully, safety. I tightened my grip on Sammy’s hand and dug my heels into the ground. Please visit the flash fic group on Facebook and check out the links to the other authors’ flash fics for this week! I really loved Theo’s this week. Rhys Ford has always been one of my favorite writers so I am sure it comes as no surprise to anyone when I say I loved “Sloe Ride”. I was so eager for Quinn and Rafe’s story and it did not disappoint. As always, Rhys’ writing was simultaneously concise yet lyrical and her characters were layered and complex. She did a beautiful job with the dynamic between Quinn and Rafe and Rafe’s ability to understand Quinn’s uniqueness without trying to change him was refreshing. Learning more about their history together was interesting too and added an unexpected layer to the story. I adore the Morgan clan and I loved seeing them through Quinn’s eyes, one of the family, but an outsider within it. His relationship with both Donal and Brigid was fascinating and the flaws and the missteps in the ways they all interact added another interesting layer to the story. The imperfections make them so much more realistic and human. The mystery in the story was interesting and complex and there was a little twist to it I didn’t expect. Rhys does an excellent job getting inside the killer’s head and giving them a sympathetic side, even as you’re horrified by what they’ve done. My only issue with the book is that it means we’re nearing the end of the “Sinners” series. *gulps* I’m not ready for that yet. I guess I’ll just have to savor what’s left. “Sloe Ride” is not to be missed. 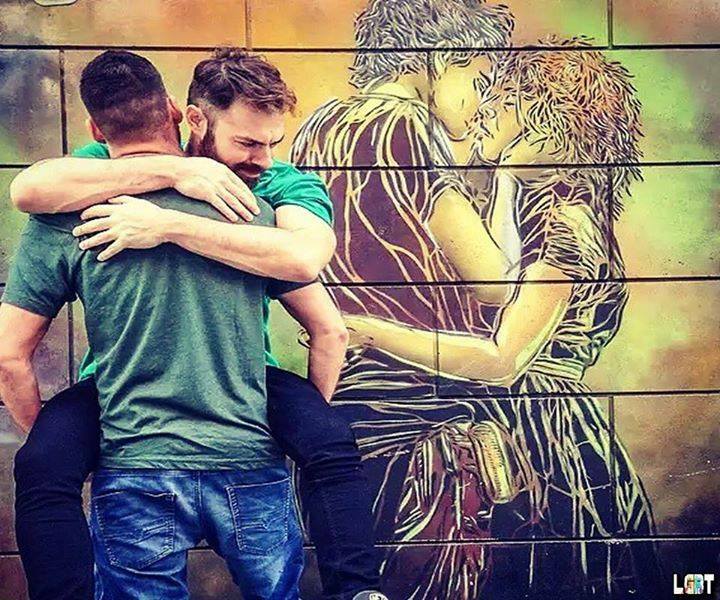 “Jesus, I can’t believe that was us,” Nicolas said, voice hushed and reverent as he traced his fingertips across the mural painted on the wall of the building. “Just as well you didn’t have a beard as Vera though,” Julian pointed out. Certain traits carried over from lifetime to lifetime, although thankfully facial hair wasn’t one of them, since gender wasn’t either. They’d been every combination of couple throughout history, their gender and orientation flowing and blending. They’d ceased to care. Waking up in a new life in a different gender was no longer the shock it had once been, although the loneliness lingered until the soulmates were reunited. The fears changed from day to day. What if the artist was intent on outing them to the world? What if they’d be taken by the government and studied for research. Worst of all, what if it damaged their ability to be together in this life and all the ones in the future? Dying wasn’t a fear, but permanent separation was. After millennia together, lifetime after lifetime, being together wasn’t simply a need, but a necessity. Unlike the couples around them who Julian simultaneously envied and scorned, he couldn’t simply walk away from Nic. They were bound together. By what or whom, they’d never been able to discover, but something drove them to live life after life together and something helped them remember. A cold feeling in the pit of Julian’s gut told him this artist knew something. They’d spent years tracking the murals from city to city, country to country, and they both believed they were closing in. But what happened when they did? What would that mean for him and Nic? They wanted answers, but at what cost? Nic turned his head, but not before Julian saw the raw fear and anguish there. “You and me,” he echoed, but the pounding of his heart against Julian’s chest said more than words ever could. Julian buried his head against Nicolas’ neck. Until the end, he thought, terrified that this time would be the last. Helena’s already pestering me to continue. What do you think? Is there story potential there? I think I already know the twist. Please visit the flash fic group on Facebook and check out the links to the other authors’ flash fics for this week! I really loved Helena’s this week.